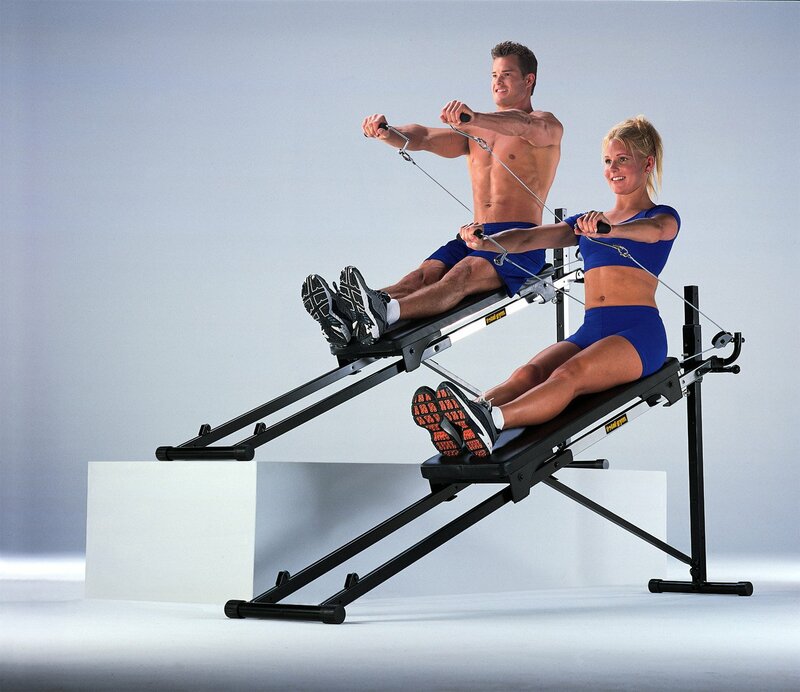 Total Gym equipment have long provided quality full body workouts at incredibly affordable prices. The Total Gym 1100 is no exception to this rule.It’s one of our top picks of the best home gym for this year. 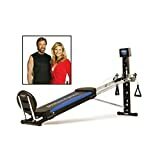 Like its sister products, this product also makes use of an ergonomic slide board and your own body weight and gravity to produce lasting fitness results. Comfortable handles and additional attachments ensure that 60 exercises can be performed to strengthen the entire body through this company’s unique form of resistance training. Priced at $219.00 currently on Amazon, the Total Gym 1100 would make for a great addition to any home gym. Whether someone is a fitness beginner or fitness enthusiast, the resistance training from this home fitness equipment will ensure that anyone can work towards or maintain a sculpted body with hard work and dedication. Right off of the bat, anyone that is already familiar with these fitness products will recognize the traditional slide board and sleek aesthetic form factor of that this product exudes. However, this 1100 model has added an outstanding multi-function bar that comes as an included attachment. This makes the 1100 exceedingly versatile, as it allows for additional fitness routines that complement the traditional full body workouts that this company is known for. This bar can be placed at the top or bottom of the product to add workout variety. Additionally, these gym solutions have built a reputation for easily folding and being easy to store. This 1100 model in particular lives up to its billing in this regard as well. Within a minute, the 1100 can be folded and stored away neatly and conveniently. At 54 pounds, the product should not be too unwieldy or cumbersome for most users when it needs to be folded. Once folded, its dimensions are reduced to just four feet by 12 inches small, which makes it easy to slid under a bed or into a closet. Perhaps one of the biggest draws to this product is its scaling resistance since it comes equipped with six differing levels of resistance, and each level will utilize the user’s weight when gauging the resistance. As such, this gym is not simply for weight loss. Rather, it can be used as a quality strength training gym as well. To further this point, weight bars can be added to the gym for users that need the added weight for taking their strength training to the next level. It is especially worth reiterating that this model is incredibly easy to use. In fact, it is practically effortless since the sliding ergonomic board is easy on the joints and intuitive when learning to use it for the first time. Further, the 1100 provides comfortable handles and wing and leg attachments as well. Due to this, users can feel confident that exercising with this product will be a pleasant experience. The experience will also be productive where ease of use is concerned since Total Gym provides handy guides and exercise diagrams so that users will be able to easily understand the movements they will need to have a quality full body workout. The Total Gym even comes with a nutrition guide to ensure that anyone gets the maximum results from using the product! These little touches go a long way and demonstrate why Total Gym has become such a prominent name in home fitness. Finally, the Total Gym 1100 is affordable. At $219.00 on Amazon, this product will give all the full body results you need at a price that is incredibly low! After all, a typical gym membership would exceed the cost of this product after just a few months of membership fees. When one considers the gym’s low cost plus the added convenience of having a comprehensive fitness solution at home, this equipment truly is a compelling option that almost anyone should consider for their fitness goals. It should be noted that bodybuilders and serious strength training enthusiasts should probably look elsewhere. This model supports a maximum weight of 275 pounds, which is something to keep in mind for these individuals. Further, even with added weight bar accessories, it is unlikely that the 1100 could support their weight training goals. In short, this is not the ideal product for those looking to put on serious muscle. Still, for those that simply need a great strength training gym or weight loss gym, this product will completely satisfy their needs. Also, the 1100 model can take up quite a bit of floor space when it is not folded. Keep this in mind if you are looking for a home gym that will fit in a bedroom or similarly confined spaces. This product also does not use the highest quality components. Yet, this should be expected for a product that is this affordable. What is important, however, is that this product will still offer similar results as home gyms that cost in the thousands of dollars. When it comes down to price vs. performance, the Total Gym 1100 stands out from the competition. In conclusion, this piece of equipment makes a fine addition to almost any home gym. Easily affordable and easy to use, the Total Gym 1100 will get results for those looking to either lose weight or gain strength. As noted, this product is not for bodybuilders, but almost anyone else will get great results from using this home gym solution. Simply put, when it comes down to price and performance this product is a true industry leader.